The classification of both wild and cultivated forms of Beta vulgaris is confusing. It is generally accepted that all cultivated beets belong to the Beta vulgaris subsp. vulgaris subspecies. This subspecies is divided into the following groups: root beets Crassa (fodder beets), Altissima (sugar beets) and Conditiva (garden beets), and leaf beets Flavescens (Swiss chard) and Cicla (spinach beets) (Oyen, 2004). In the UK, the name "fodder beet" refers to varieties with smaller roots and high DM content, while types with broader roots that sit high in the soil are called "mangels" or "mangolds". In Germany, "mangolds" refers to white varieties of leaf beets (Henry, 2010). Fodder beet (Beta vulgaris subsp. vulgaris L.) is a biennial plant grown for its fleshy and swollen root. The size, shape and colour of the root are extremely variable and depend on the variety. Roots from fodder varieties tend to be less deeply buried (up to 2/3 above ground) than those of sugar and intermediate fodder-sugar varieties (ADBFM, 2009). The vegetative part develops mainly during the first year of growth. The dark green, heart-shaped leaves are borne in a rosette, lying horizontally to catch as much light as possible. After the first year, if the root is not harvested and after exposure to cold, the rosette turns into a 50-80 cm tall flower stalk that bears small, green and bisexual flowers without petals (Henry, 2010). Fodder beet crops that are intended for fodder (rather than for seed production) are cultivated as annual crops and the roots must be harvested before winter since they do not withstand frost (ADBFM, 2009). In Northern Europe, fodder beet has been used as fodder since the Middle Ages. It became a major winter feed for cattle in the 1800s. Traditional fodder beet had multigerm seeds resulting in clusters of 2 or 3 plants, which required manual separation (thinning) of the young plants. This labour-intensive aspect of fodder beet cropping led to its decline after World War II and fodder beets were replaced by maize in ruminant diets. The development of monogerm varieties in the 1970s allowed full mechanization and higher yields, resulting in a renewed interest in fodder beet (Henry, 2010). Three types of fodder beet varieties have been defined depending on their DM content: fodder (less than 12% DM), fodder-sugar (12-16% DM) and sugar-fodder (16-20% DM) (ADBFM, 2009; Limagrain, 2011). 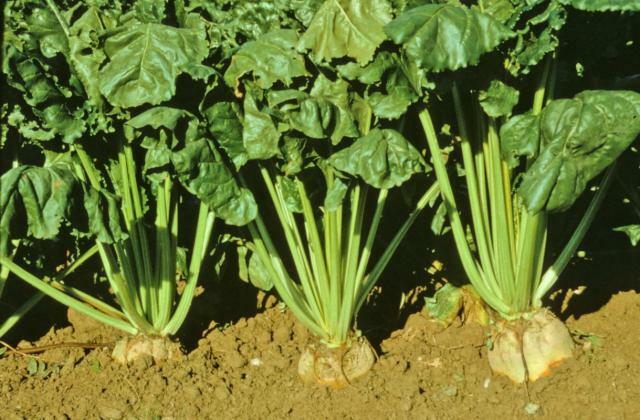 As a rule, beet varieties are only accepted as sugar beet if the DM is higher than 20% and if the beet is white (Højland et al., 1994 cited by OECD, 2001). The main use of fodder beet is for feeding ruminants, though it can also be fed to pigs (Henry, 2010; Rees et al., 1956). The high sugar content makes fodder beet palatable and a valuable energy source (Draycott et al., 2003). It is also a potential crop for biofuel production (Henry, 2010). Fodder beet originated in the Middle East and was being used as cattle feed in ancient Greece in 500 BC (Henry, 2010). Beta vulgaris L. ssp. maritima is regarded as the parent species of the cultivated beets (fodder beet, sugar beet, beetroot, yellow beet, Swiss chard) (OECD, 2001). The crop spread to Europe, was introduced into the USA in 1800 and is now cultivated worldwide in the cooler climates (Northern America, New Zealand and at higher altitudes (above 600-1000 m) in the tropics (Oyen, 2004; OECD, 2001). 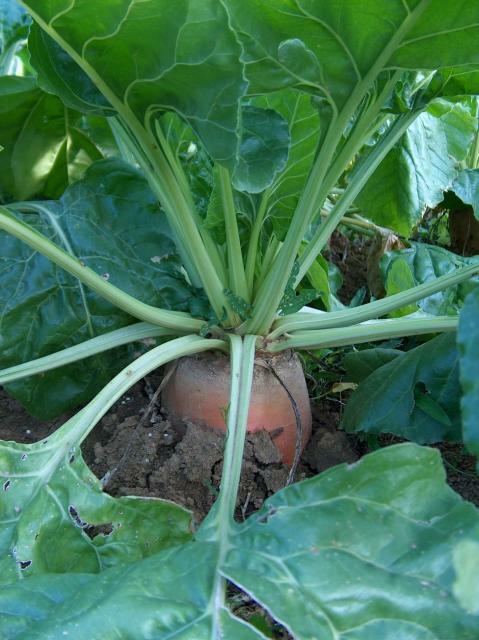 Sugar beets were derived from fodder beets in Continental Europe during the 1800s as sugar cane was subjected to English blockades during the Napoleonic wars. In 2008, France was the main producer of fodder beets (13,000 ha) followed by the United Kingdom (10,000 ha) and Belarus (8,000-10,000 ha) (Henry, 2010). Fodder beet can grow at temperatures between 8°C and 25°C (ADBFM, 2009; Oyen, 2004). Frost below -3°C can damage the seedlings. Soil pH should be higher than 6.5 because fodder beet is susceptible to acid soils that cause physiological yellowing. Soil liming is recommended but boron availability should be checked to prevent black heart disease (ADBFM, 2009). Fodder beet crops are moderately tolerant to soil salinity and can withstand irrigation with saline water (Oyen, 2004). Fodder beet is drought tolerant and can provide fodder at the end of a dry summer when other plants have disappeared (ADBFM, 2009). Fodder beet roots can be harvested when physiological maturity is reached, i.e. when basal leaves are dried. However, as roots do not spoil in soil, early harvest is not necessary and roots can remain in the soil as long as no damaging frost occurs. If the roots are removed from the soil they can be stored in large outdoor clamps provided teperatures do not drop below - 5°C. They should then be covered with straw. It is possible to store fodder beet roots for 4 to 5 months provided they are healthy and were undamaged during harvest. Frozen beets can be left to thaw and must then be fed to animals as soon as possible. Severely diseased beets should be avoided, and those mildly diseased should be kept separately to healthy ones and fed as soon as possible (ADBFM, 2009). In cooler parts of the tropics the roots can be stored in the ground for use during the dry season (Göhl, 1982). Fodder beet roots that have been previously cleaned (stones and soil removed using rotating drums) can be fed whole to animals or can be chopped to facilitate intake (ADBFM, 2009; Miserque et al., 2003). Fodder beet is particularly productive and is the highest yielding crop grown under temperate climates. Yields of 50-75 t of fresh roots/ha are common and up to 100 t fresh roots/ha can be obtained. The crop also produces 10-20 t/ha of leaf material (Draycott et al., 2003). Fodder beet roots and foliage can be grazed. Strip grazing is recommended: cattle enter the stand and each animal is allowed to graze 3 linear meters of fodder beet for 2 hours a day. Grazing saves many harvesting and distribution operations (ADBFM, 2009). Strip grazing with pigs is also possible (Limagrain, 2011). Root crops cause soil losses during harvest (Ruysschaert et al., 2004). Sugar beet harvesting may result in 17 t earth losses/ha. Fodder beet roots are less heavily grooved than sugar beet roots and, therefore, lift less soil when they are harvested (Boardman et al., 2006). Fodder beet crops are amongst the largest consumers of CO2; they also release the highest amounts of O2 (Kerten, 2003). Genetically modified fodder beet (Roundup Ready) has been developed but in 2011 no such variety had been released in Europe (GMO Register, 2011). Field trials were authorized in Denmark in 2005 for a four-year period. Digestibility and feeding values of Roundup Ready fodder beet were similar to those of conventional varieties (Hartnell et al., 2005). The GM fodder beet resulted in milk yields intermediary to those of 2 different types of conventional fodder beet. Fodder beet type did not affect the concentration of hormones and growth factors in whey (Weisbjerg et al., 2001). Fodder beets have a relatively low DM content, from less than 12% to 20%. They are mainly an energy feed due to the high content of water soluble carbohydrates (55 to 70% DM, mostly sucrose). There is a positive relationship between DM content and sugar content; intermediate fodder-sugar types contain both more sugar (up to 80% DM) and DM (up to 20%) than types used only for fodder. The DM contains about 20% NDF and crude fibre content is rather low (5-8% DM). Fodder-only types are richer in fibre. Protein content is also low at about 6-10%. Mineral content of clean roots is 8-10% DM for low-DM beet but only 4-6% for high-DM varieties. Both Ca and P are low (Dulphy et al., 2000). Cases of poisoning have been reported in cows fed on fodder beet. Symptoms described were similar to those of milk fever and were alleviated by calcium injections (Price, 1954). Leaves contain large amount of oxalic acid (calcium oxalates) and should not be fed in large quantities to livestock as it has a deleterious effect on Ca status. Oxalates bind circulating Ca, a factor contributing to milk fever (Duncan et al., 1997). However, levels of oxalic acid between 3.0-6.0 g/kg DM have been observed in the roots, far below the 100 g/kg level that is considered to be dangerous (Boyd, 1991). Freshly harvested fodder beet roots can contain high levels of nitrates, which are known to cause scouring in farm animals. Scouring was observed in pigs fed fodder beet containing high levels of nitrates and the digestive disturbance ceased within two days when fodder beet with very low nitrate levels was substituted. It has been suggested that nitrates rather than oxalates were the cause of the scouring observed in other experiments (Boyd, 1991). In sows, cases of abortion in herds fed on high nitrate/nitrite fodder beet roots have been reported (Bouska, 1991). Fodder beet is well appreciated for its palatability and is often used to replace cereal grains as a source of energy. It is a fresh forage, highly valuable for winter feeding, with a positive effect on the health status of the animals (Chenais, 1994a; Dulphy et al., 2000; ADBFM, 2009). Due to the large amount of fermentable carbohydrates and low contents of fibre, protein and mineral matter (which results in a weak buffering capacity), feeding fodder beet may cause acidosis though the risk is low. Dry matter intake should not exceed 0.8% LW (Dulphy et al., 2000; Enemark et al., 2002). They should be included progressively in the diet in order to acclimatize the rumen flora to a sucrose-rich feed. A fodder beet-based diet should be balanced with fibrous forages such as hay (ADBFM, 2009). Ketosis can also result from feeding excessive amounts of fodder beet (Dulphy et al., 2000). The fill value of a low-DM fodder beet is lower or comparable to that of fresh grass, silage or hay, while the fill value of high-DM fodder beets is even lower and comparable to that of concentrate feeds (INRA, 2007). Fodder beet is highly digestible: OM digestibility is in the 87-90% range (Dulphy et al., 2000), although a value of 96% has been reported (Sabri et al., 1988). The values for lactation NE are about 7.9-8.2 MJ/kg DM (INRA, 2007; Donosa, 2010), similar or higher than those of cereal grains. However, a DM intake of fodder beet higher than 0.5% LW slightly depresses digestibility and the energy value, the lactation NE dropping to 7.1 MJ/kg DM. Roots that have been insufficiently cleaned contain large amounts of mineral matter that decrease their energy value (Dulphy et al., 2000). An in vitro study concluded that the larger amounts of substrate fermented with fodder beet have a potential to supply more energy for microbial synthesis than a barley/oat grain mixture or raw potatoes. The replacement of a barley/oat grain mix by fodder beet did not result in a decreased supply of glucogenic substrates, and fodder beet facilitated microbial growth (Eriksson et al., 2004b; Eriksson et al., 2004c). The protein content of fodder beet is low and beet protein is quite soluble (N effective degradability of 85%) (INRA, 2007). Nitrogen supplementation is therefore necessary (Dulphy et al., 2000). Fodder beet can help to control an excess of dietary protein. Supplementing dairy cows fed alfalfa/grass silage with fodder beet resulted in a lower concentration of milk urea and in a lower urea:creatinine ratio in the urine (Eriksson et al., 2009). Fodder beets are valuable for dairy cows. Lactating dairy cows can be fed with 20 kg/d of fresh fodder beets (about 3-4 kg DM). A 1-week transition with 1 kg (DM) of fodder beets is recommended (ADBFM, 2009). Diets with 3 or 6 kg (DM) of fodder beets can support a milk production of 30 kg/d (Dulphy et al., 2000). Many studies have reported that the inclusion of fodder beets increases the fat and the protein contents of milk. This effect is particularly notable with diets based on forages such as grass silage and hay that tend to give low milk fat and protein. 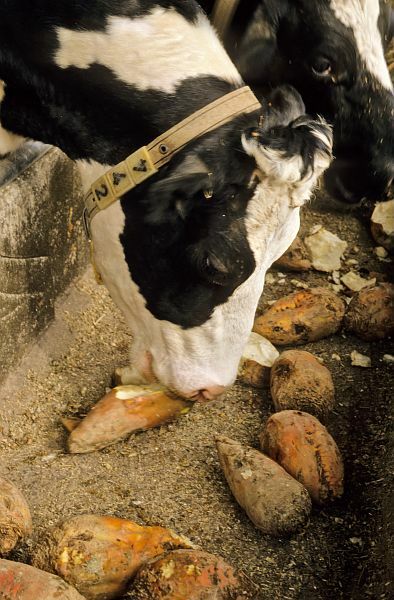 The effect is small when fodder beets are included at less than 0.8% LW (DM basis) in the diet, and insignificant when fodder beets supplement maize silage (Dulphy et al., 2000). In lactating cows, the inclusion of fodder beet in the diet reduced silage DM intake but resulted in an increase in total DM intake and estimated ME intake. It had no significant effect on milk yield, though it increased milk protein content and milk energy output. However, milk energy output expressed as a proportion of ME intake was significantly reduced (Ferris et al., 2003). Fodder beets tended to decrease the milk yield and the energy corrected milk yield was lower whereas the composition of the milk was unaffected compared to a total mixed ration with barley (Mogensen et al., 2003). The milk of dairy cows fed on hay and fodder beet roots basal diet has generally high undesirable saturated fatty acid content (Collomb et al., 2004). Milk fatty acid profile could be enhanced by supplementation of basal diet (hay ad libitum and 15 kg fodder beet roots) with either 1 kg ground rapeseed, or 1.4 kg ground linseed, or 1 or 1.4 kg ground sunflowerseed (Collomb et al., 2004). Fodder beet can be associated with potatoes. However, in lactating cows, compared with barley, a mix of fodder beet and potatoes (80:20) appeared to reduce silage intake, relative to the control diet, and decreased milk production by a magnitude corresponding to the resulting lower intake of ME (Eriksson et al., 2004a). Suckler cows can be given 30-40 kg/d of fresh fodder beet (4-6 kg DM) but the amount should not exceed 10% LW (ADBFM, 2009). Lactating ewes can eat 4-7 kg/d of fresh roots (0.6-1 kg DM) though the precise amount depends on the animal requirements. A four-week adaptation period (with 1 root per day) is recommended. Older ewes should be fed chopped roots (ADBFM, 2009). Lactating goats can be fed 4-5 kg/d of fresh fodder beet (0.6-0.75 kg DM). Gestating animals can eat 1 kg/d of fresh roots (ADBFM, 2009). Like other root crops, fodder beet might be of good value in organic dairy farming, assisting with energy supply as well as nitrogen balance. It could also be beneficial by reducing the amount of potential human food used in animal feeding (Eriksson, 2000). Fodder beet is a relatively uncommon crop in tropical and subtropical countries, but it could be useful in periods of feed scarcity. In Sudan, a trial comparing fodder beet (a mixture roots and tops) and sorghum forage concluded that fodder beet had a higher nutritive value (lower crude fibre, higher protein and ME), which was reflected in the lower DM intake and equal or superior milk yields by cows fed on beet roots without any adverse effects. Feeding cost was also much lower (Khogali et al., 2011). Fodder beet roots are a palatable energy feed for growing pigs. They can be fed fresh, dried or ensiled. However, while the fibre content is low, it is still higher than that of wheat and maize grain, and substituting fodder beet for cereals may cause a reduction in the value of other dietary ingredients. Lysine (2.3 to 4.3% of protein) is likely to be the first limiting amino acid in fodder beet. Estimates for the DE value of fodder beet for growing pigs are in the 13.2-14.4 MJ/kg DM range, i.e. slightly lower than for cereal grains. Drying the roots had no effect on the DE or ME. Feeding fodder beet to pigs is safe though some cases of scouring and abortion have been reported in animals fed roots containing high levels of nitrates (see Potential contraints above) (Boyd, 1991). Fresh fodder beets are bulky due to their high water content and pigs fed fresh fodder beet consume slightly lower levels of the root crop than pigs fed the dried material. However, the water content of fodder beet seems to be quickly reduced following ingestion, and growing pigs can consume large quantities of fresh fodder beet. For instance, in pigs fed 70% (DM basis) of fresh roots, DM intake were only 12% less than for pigs fed the control compound feed (Boyd, 1991). In sows, fodder beet roots increase eating time, reducing feeding rate by 20% with the positive effect of decreasing aggressive behaviour (Appleby et al., 1987 cited by Love, 2008). In unbalanced diets, the use of large amounts of fodder beet in growing pigs usually depresses the performance of growing pigs, due to the lower protein content of the roots. Direct substitution of fresh fodder beet for increasing amounts of a balanced compound diet impaired growth performance, lean and fat deposition and killing-out proportion, resulting in lower economic performance in spite of the reduced feed cost. In balanced diets containing 15 to 40% (DM basis) of fresh or dried fodder beet roots, growth performance (daily live-weight gain and feed conversion ratio), fat deposition and killing-out percentage decreased significantly as the proportion of fodder beet increased in the diet (Boyd, 1991). Ensiled fodder beet root gave good results in finisher pigs as it increased daily weight gain by 15.7%, improved feed conversion ratio and lean-to-fat ratio (Schichter, 1993). Sows receiving diets where fodder beet roots partially (25%) replaced concentrates had poorer scores at mating (55% vs. 85%) and their litter had lower birthweights (Makaganchuk et al., 1974). Silages containing a limited proportion of fodder beet roots (23%) could be fed to pregnant and lactating sows without affecting fertility (Moshkutelo et al., 1988). Horse can consume 0.5 kg/100 kg LW of fresh fodder beets. Chopping the roots is not necessary (ADBFM, 2009). Højland, J. G. ; Pedersen, S., 1994. Sugar beet, Beetroot and Fodder Beet (Beta vulgaris L. subsp. vulgaris) : Dispersal, establishement and interactions with the environment. The National Forest and Nature Agency, Copenhagen, Denmark. 73 p.
Weisbjerg, M. R. ; Purup, S. ; Vestergaard, M. ; Hvelplund, T. ; Sejrsen, K., 2001. Studies on genetically modified fodder beets for dairy cows. DJF Rapport, Husdyrbrug, 25: 39 pp.